Tina Nguyen is a reporter for The Hive, covering politics and the media. Will Reince Priebus Lose His Job Over Donald Trump? Nguyen says the threats she feared have not materialized, and she has received congratulations from around the industry. Translation: The threats were imagined, or concocted for publicity purposes, but in any case proved to be nonexistent. For some reason this didn’t make it into Brian Stelter’s newsletter. Perhaps for reasons of space. Or perhaps because that might spoil the purpose of the entry: to paint another harum-scarum portrait of those dangerous, menacing Trump supporters. 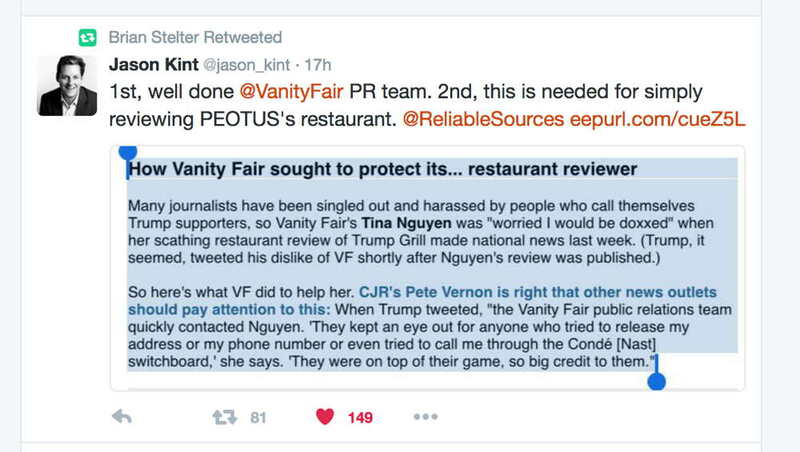 So even more people got the same fallacious impression that a mild-mannered, apolitical “restaurant reviewer” was placed in danger for just writing another bad review of another eatery. Just as Stelter intended.